You know about the mountains and the snow, the skiing and the biking, but have you seen the rivers or the deserts, the canyons and the ancient rock art, the endless flat plains or the awesome abandoned cliff dwellings? The experiences are waiting for you. We have no 2018 trips in Colorado open to the public. As usual, we are open to inquiries about private trips in the wonderfully varied backcountry of Colorado, and can make suggestion based on your group’s interests and abilities. Look over what this state has to offer, so much more than just mountains, and contact us to organize your custom dream getaway for your group. COLORADO is so much more than mountains and snow. 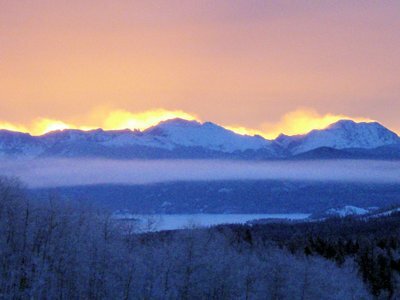 Perhaps best known for its skiing, and the magnificent Rocky Mountain National Park, among our own favorites are the whole North-Western corner of the state that includes the Dinosaur National Monument, and the South-Western corner around the city of Cortez, the land of the ancient Anasazi and the amazing ruins they left behind at places like Mesa Verde, Hovenweep, and others you have never heard of – Colorado is a land of color, a land of extremes. Let us surprise you with places you haven’t seen. 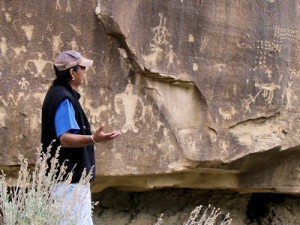 Our Anasazi Circle Tour is now, we hope, in the final planning stages after years of discussion and exploration. Its been hard to get there to work out the details when we are busy leading people to other spectacular places, like Canyonlands or Arches or Escalante or Lake Powell….. because all of these are all best visited in the same spring/fall times when the temperatures are not too high, or too low. This will be a 6 day lodge-based trip, the first and last days will be travel days to and from our starting point, the airport in Grand Junction, CO. Those days will include travel to and from our base, near the town of Cortez in Colorado. 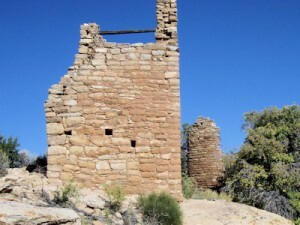 Each day, we will travel by van to another of the area’s wonders: One day will be a visit to the spectacular ruins at Mesa Verde National Park, not just the cliff dwellings, but lesser-visited ruins of farming cities on top of the mesa; another day at Hovenweep National Monument and its wonderful towers will fill a full day, and if we have time, we’ll end that day with a visit to Lowery Pueblo and one of the largest Kiva ruins in the Southwest; A third day will be spent hiking along Sand Creek in Canyons of the Ancients National Monument, with smaller ruins and views around every corner; and another day will be spent in the wonderful lost world of the Ute Mountain Tribal Park, with a Ute guide, one day to see all of the rock art, the valley-bottom cities that, unlike Mesa Verde, are still in their ‘ruin’ state covered with blowing sand and fallen rocks. This leaves it all to your imagination, unexcavated, unexplored. 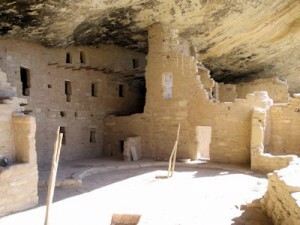 Finally we hike into a set of cliff dwellings that are only accessible via ladders and ancient narrow trails. Hiking will vary from 3 to 9 miles per day, some of it strenuous but none of it technically difficult. You will need a day pack to carry lunch and snacks – provided – and we recommend 3 liters of water per person per day, most of this land is desert. If this sounds like something you need to do, please contact us to get your group outside with us! Colorado Places; Rocky Mountain National Park and the neighboring Arapahoe National Recreation Area (one of our guides lives here), Mesa Verde National Park (a World Heritage site), portions of Hovenweep and Dinosaur National Monuments (both shared with Utah), Canyons of the Ancients National Monument, Colorado National Monument, Black Canyon of the Gunnison National Park and the adjacent Cunrecanti National Recreation Area, Great Sand Dunes National Monument, Ute Mountain Tribal Park, nine vastly different Wilderness Areas, the Canyon Pintado National Historic District (really! The canyon is filled with indian rock art), and millions of acres of BLM land with a few treasures you have never heard of, such as the Sand Wash Basin, Irish Canyon, or Douglas Mountain. All waiting for you. Contact us for a custom tour. Grand Junction, CO, is in the middle of the western edge of the state, and is home to the small but spectacular Colorado National Monument. Moab, UT, is a bit to the southwest, while the spectacular ruins of Mesa Verde, Hovenweep, and the wonderful Ute Mountain Tribal Park are far to the South. To the North is the Dinosaur Diamond, a huge area of CO/UT filled with fossils, but also filled with indian rock art and the surprising river-carved landscape of Dinosaur National Monument.